Annual or perennial herb 0.5 - 2 m tall Leaves: about midstem and above, opposite, on 1 - 7 cm long stalks, somewhat elongate triangular to egg-shaped or lance-shaped, 4 - 14 cm long, 2 - 9 cm wide, with blunt or indented bases, and non-toothed edges. Inflorescence: of several, terminal or axillary, compact clusters with one to fifteen flowers on short, 0.5 - 5 mm long stalks, and each cluster subtended by a pair of 2 - 17 mm long leaf-like bracts. Each flower sits atop a green, 0.5 - 1.5 cm tall, bell-shaped cup (involucre) formed by five fused bracts with triangular tips. Flowers: rose-pink or yellow, sometimes white or striped, usually hairless, 3 - 5 cm long, radially symmetric, funnel-shaped with a long, narrow tube, and five, abruptly flared lobes. Sepals: showy, brightly colored, not green, and mimicking petals. The five sepals are fused for most of their length, constricted above the ovary into a long, narrow tube, then separated into five, abruptly flared lobes. Petals: none. Stamens: five, long, and extending beyond the sepal tube. Pistil: with one, single-chambered, superior, somewhat globular ovary; one, long, threadlike style, which extends beyond the stamens; and a rounded, head-like stigma. Fruit: a hard, dark brown or nearly black, 0.7 - 1.1 cm long, broadly ellipsoid to inversely egg-shaped, one-seeded, nut-like achene, which is tightly enclosed by the remnant bract cup (involucre). The achene is round or slightly five-angled in cross-section, smooth or inconspicuously bumpy or warty, and either hairless or hairy. Root: a swollen and somewhat tuberous taproot. Stems: usually several, erect to slightly decumbent, branching, light or bright green, sometimes with a yellow or pink hue, mostly hairless, but sometimes hairy near the base or even glandular-hairy further up; if hairy, often in two lines. Similar species: Mirabilis jalapa is quite different from other species of Mirabilis in the Chicago Region because it has such a long sepal tube above the ovary (2 - 3 cm long), where as the other species have only 2 - 3 mm long sepal tubes. Habitat and ecology: Introduced as a cultivated plant, typically not persisting, but possibly found at waste places such as landfills or dump sites. Notes: This species was introduced from tropical America as a garden plant. It was cultivated for ornamental and medicinal purposes by the Aztecs. 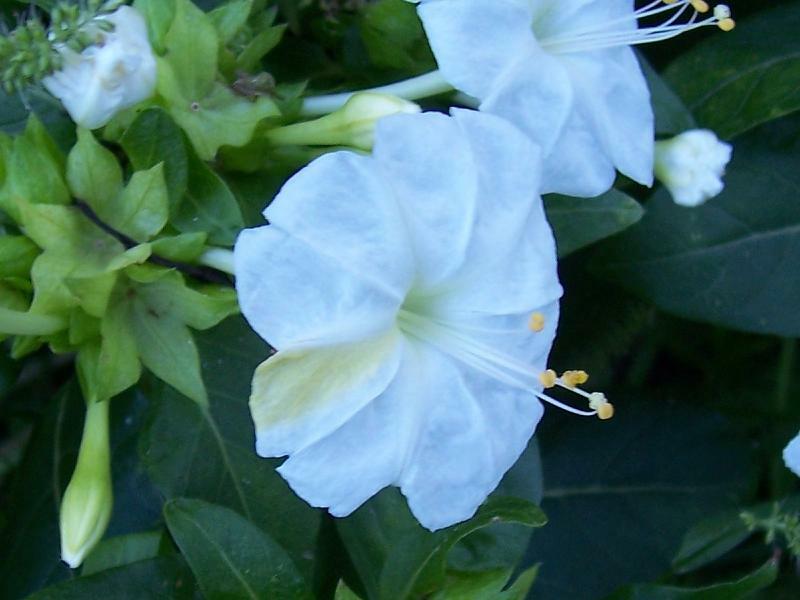 Most of the cultivated material is the typical variety of the species, M. jalapa var. jalapa, which has brightly colored flowers. There is another variety, M. jalapa var. oaxacana, which has white flowers with longer and more slender tubes. Perennial from a thick, tuberous root, but grown as an annual; lvs ovate, petioled; invol cal-like, of 5 united bracts, deeply 5-lobed, 1-fld, 6-8 mm at anthesis; cal cor- like, showy, opening in late afternoon, white, yellow, red, purple, or variegated, funnelform, with long, slender tube 2-3 cm, the limb 2-3.5 cm wide; 2n=58. Native of tropical Amer., widely cult., and occasionally escaping in our range.